Looking through the movie magazines of the 1970s, several horror movie highlights of the decade are inexplicably absent. 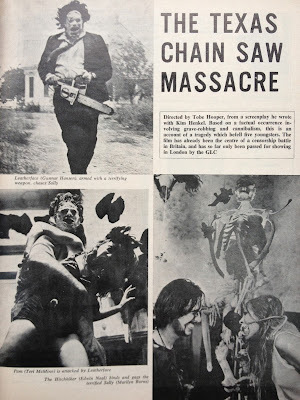 I still can't nail down an exact release date for The Texas Chain Saw Massacre in London (my best guess is November 21st, 1976), because the most popular movie magazines didn't mention it at all or carry any advertising. Intrigued, I found details of the delayed and difficult cinema release and was surprised that early reviews, even in horror film magazines, were very dismissive. A box office hit, but "blatantly amateurish"
Tobe Hooper's The Texas Chain Saw Massacre opened in the US on October 1st 1974 and initially made over $30 million (its North American gross - Box Office Mojo). Spectacularly successful, on a production budget of $300,000. Audiences had already been keen to be disgusted by The Exorcist (1973), another provocative film which split public opinion over whether the filmmakers had gone too far. But that big studio release had plenty of highly visible defenders on TV and in the press. Tiny independent low-budget horror The Texas Chain Saw Massacre had a rougher ride, also getting mixed reviews in the US and mostly bad ones in the UK. 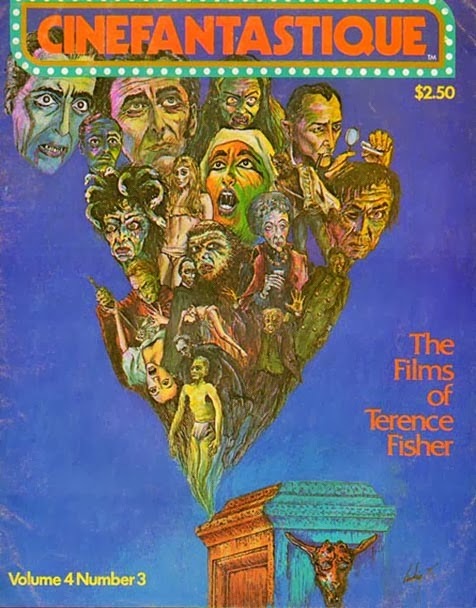 I've not seen many American magazines from the time, but even Cinefantastique (Volume 4, number 3, 1975) only gave a short four-paragraph review, calling it "blatantly amateurish" and a "stomach-churning little sickie-quickie", contrasting with two entire half issues dedicated to The Exorcist the year before. It took twelve years before Chain Saw was given a respectful retrospective alongside their coverage of the 1986 sequel. There's a similar decade of delay in the UK, before Chain Saw was celebrated rather than demonised. Meanwhile, fantasy film fan magazine Photon (issue 26, 1974) has a whole page review from Ron Borst. This was the first review I saw of Chain Saw in a genre magazine, and it was encouraging, "quite possibly the most terrifying brutal example of a horror film yet produced". Though Borst's review is defensive, tempered by other critics' bad reviews and his date calling it "sick and disgusting". But when did anyone see it in the UK? The case study on the BBFC website is a good starting point, but misses out the key date that I'm interested in - when did Chain Saw open to the public? To even get a UK release, Chain Saw was submitted to the British Board of Film Censors (as it was called then) who felt it was 'unsuitable' and refused it a certificate. No certificate meant that it couldn't play in cinemas with the normal national distribution - it was effectively banned. In the summer of 1975, when James Ferman took over as head of the BBFC, he screened Chain Saw again, for himself, but still wouldn't certify it, unable to work out how even an extensively-cut version could be released. For a lucky few, Chain Saw was screened twice, uncertified, at the London Film Festival in November 1975 at the National Film Theatre. By the end of 1976, another year later, the Greater London Council then screened a version cut by the distributor (listed as 80 mins, 30 seconds in Films and Filming, January 1977) and approved a London-only certificate 'X' (see the above poster). This set a precedent for local Borough Councils to show it anywhere in the U.K. after they'd watched it for themselves. In this unusual way, The Texas Chain Saw Massacre opened in London cinemas in November 1976, over two years after the first US releases. In Gunnar Hansen's book 'Chainsaw Confidential', he pictures a wonderful preview leaflet for advanced preview screenings at the Prince Charles Cinema in London. Ten midnight screenings ran from November 11th to Saturday 20th, presumably to generate word of mouth publicity before it opened properly on Sunday 21st, which is now my best guess for a U.K. release date. Hansen also mentions that The Times reviewed the film in November, again indicating that this was the timing of its official release. Now came the reviews. I've much more coverage of its reception in British magazines. 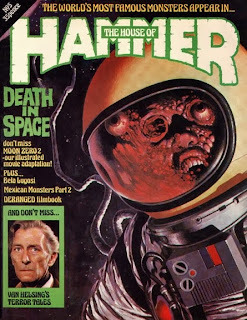 The reviews were bad, one of the worst and rudest coming from the only UK horror magazine at the time! The House of Hammer ran four pages about Chain Saw in issue 2, December 1976. Writer John Fleming noting that while it was a box office phenomenon in the US, it "has ineffective special effects; no audience involvement with the non-characters; no tension; very little gore." and that readers should "avoid like the plague". There's then a detailed two-page account of almost the entire story! This condemnation looks even stranger, when in the same magazine, the same writer reviewed another low-budget horror film based on the same events. 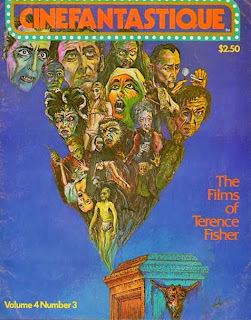 Issue 5 (published early in 1977) has a three-page review of Deranged. Again about a cannibal, littering his remote farmhouse with bones and body parts and murdering women even more graphically than in Chain Saw. But John Fleming's review of Deranged calls it "a joy" and "amazingly believable. Whereas The Texas Chain-Saw Massacre is just plain silly." If horror fans didn't like it, there was little hope of a fair deal from the mainstream film critics. But in the regular movie magazines, I'd still expect a more sophisticated response. In the December 1976 Films Illustrated, Susan D'Arcy observed that "the overall effect is simply nauseating. If this is meant to be entertainment, someone somewhere has a curious concept of it." I'd guess that was a very similar reaction to The Daily Mail. Films and Filming is surprisingly lukewarm as well, with only a single page of photos (above) and an on-the-fence review. Writer Gordon Gow reckons "the subject matter...is meretricious tosh" (despite being based on an actual crime) while praising its handling of suspense. Worse still, there's no mention of Chain Saw in the influential, wide-circulation monthly magazines Film Review or Photoplay in December 1976 or January 1977. It's not featured or mentioned and there aren't any ads, while there are full-page adverts for the London openings of Survive!, Schizo, and Death Weekend. I guess this is because it was a last-minute release, non-standard distribution, or simply too controversial. 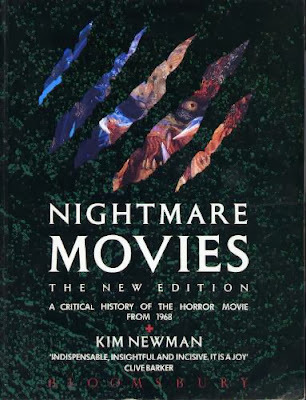 The unorthodox cinema release is also reflected by the lack of a paperback novelisation, usually an easy way to cash in and publicise a horror film. I've read that many local councils around the U.K. approved similar special certificates for Chain Saw to be shown, but it's hard to know how many actually got to see it. Wikipedia has a quote that it ran in one London cinema for a year (presumably the Prince Charles?). As banned films go, it wasn't too hard to see. But in terms of visibility, it would have been a local phenomenon rather than a national one. In the US, the film first appeared on home video in 1982, released by Wizard Video), and in 1981 in the UK. But we stupidly, initially, didn't have any rules for the classification of videotapes. The market was open to a landslide of releases of banned and uncut horror films on all home video formats. This was another, wider chance to see the film, and enabled a new generation of horror fans... of all ages. As more homes got video cassette recorders, and more newspapers complained about what they perceived was lurking in every local rental shop, garage and newsagent, Chain Saw was banned again when the BBFC completely refused it a home video certificate in 1985. To be fair, this time around, they also banned The Exorcist on video. Ridiculously, because now video sleeve art also needed to be approved, the word 'chainsaw' wasn't even allowed on any video sleeves (see below). For the next fifteen years, the only way to buy it was as a fuzzy bootleg copy made from the originally-legal videotapes. Or, on tape or laserdisc from the USA and other countries. During this time, sequel The Texas Chainsaw Massacre Part 2 also went unreleased in UK cinemas, Cannon Films unwilling to make so many cuts to please the censors. Again home video was out of the question. In 1998, the film was remastered for DVD in the US and fresh prints were struck for the 25th anniversary. This new transfer was shown at the London Film Festival and in Camden, again only with a Local Council certificate. The BBFC watched it again and finally, finally got it, this time around "impressed, rather than disturbed" (see the BBFC Case Study). They granted an uncut '18' certificate for British cinemas in 1999. The first BBFC approved home video release was in, gulp, the year 2000. 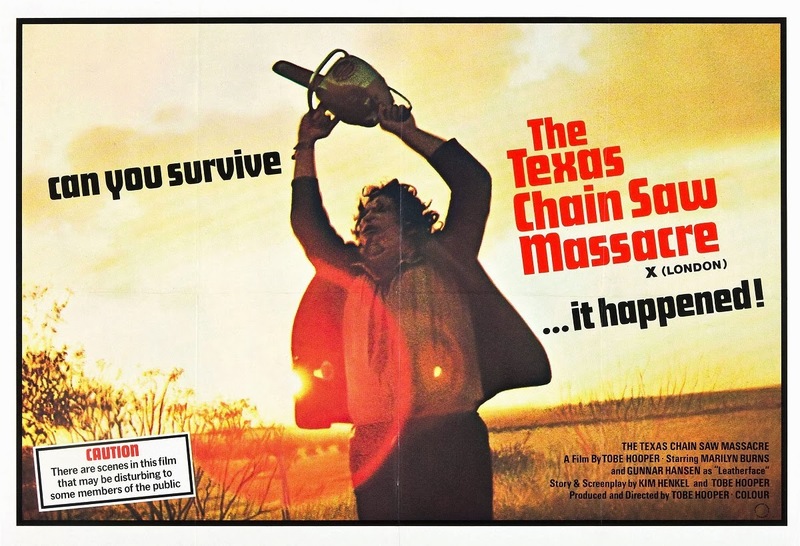 The Texas Chain Saw Massacre then appeared on British TV the same year, on Channel 4, a clear sign of how far behind the times the classifications had become. If I really wanted to get my hands dirty, and wallow in the warped, mindsets of tabloid journalists, I'd dig through the newspapers of the time to understand better how Chain Saw was originally singled out by 'public opinion', while similar horror movies trundled through local cinemas with far fewer problems. Looking back, I'm surprised at the snotty reaction in House of Hammer and Cinefantastique at the time of release, but suspect they were trying to reflect the public reaction as voiced in the mainstream press. Chain Saw would have had a better reaction if Fangoria had arrived earlier than 1979. The magazine was inspired by the tidal wave of slashers after Halloween and Friday the 13th, and promoted gory horror films as a respectable sub-genre. It was also immediately widely available (even in newsagents) in the UK, and I think that helped Chain Saw to be seen as an important influence. Film reviewer Kim Newman gave it the review it deserved in his popular, rigorous study of horror after Night of the Living Dead, in his book 'Nightmare Movies' (1984). Texas movie posters - from The Wrong side of the Art. 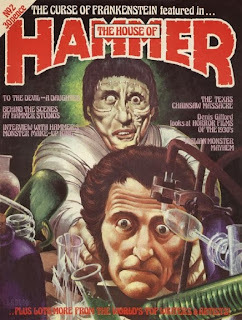 House of Hammer covers - from Monster Magazine Gallery - their copies are in better condition than mine! An excellent bit of detective work there Mark... Fascinating stuff indeed. I did try to find out the fate of the film across the water, but the Irish Censor Board is even more shadowy than the BBFC. But I expect the film would have been refused a theatrical run by the Irish board, back in the day if indeed the distributor even bothered to submit it. And like a lot of folks in the UK, we all saw it here on VHS, during those outlaw days, I remember well my local videoshop had both Ivor editions - the sleeve in your post, and the red and white sleeve... The bad reviews are surprising I must say, considering the film has a very obvious quality, more so than say Last House On The Left, and I would have expected more from Films and Filming - they gave Night of the Living Dead an excellent notice in the December 1970 issue. As for Cinefantastique and House of Hammer, shame on them, they absolutely got it wrong there ! 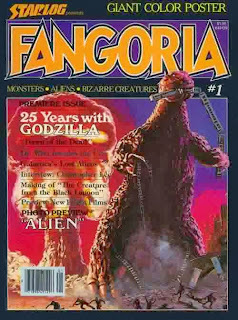 Really surprised by Cinefantastique actually - I might have my chronology screwed up here but I think Tim Lucas was writing for the magazine during this era... I seem to remember James Ferrman or one of his examiners discussing Texas Chain Saw Massacre (some years before the re-release) and the thinking at the BBFC was the film was effective censor-proof - no matter what cuts the Board considered, the film still seemed oppressively violent - and to think Tobe Hooper brought the film to the MPAA expecting a PG rating ! Yeah, it wasn't Tim Lucas writing for CFQ, thankfully (I'll add the name of the writer, now that you mention it). Tim got to go on some great set visits though. As you said, Ferman couldn't figure out any cutdown version which he could pass. I'm sure I recall reading about the SALO screening at the Compton Film Club being raided in "F&F" - I think it made an impression on me as there was an area in Wolverhampton called Compton. I'm not sure I even knew what SALO was at the time. Thanks for that Miles re: [B][I]Saló[/I][/B] in Films and Filming - that report must be in an issue I'm missing... Incredible to think a film lecturer would consider [B][I]Texas Chain Saw Massacre[/I][/B] badly made. I mean I'm biased here as it's my all-time favourite Horror film, but I think the film is very well made, and made with [I]style[/I] - that low-angle tracking shot under the swing chair is just incredible, and the scene where Leatherface delivers the hammer blow to the head of Kirk is a brilliant piece of editing - you would think a Peckinpah man would appreciate that ! 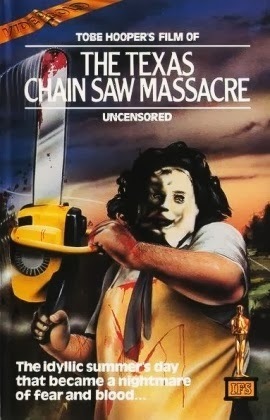 The image of Leatherface wielding the chainsaw is still one of THE most iconic images in the entire hstory of horror cinema. It's a masterpiece of horror!..I met Ed 'hitchhiker' Neal 3 times at conventions over the years,and Teri McMinn 'Pam' once..both were very nice,still have my super 8 version from Deran films from the late 70's. I was one of the 'lucky few' at that first LFF screening in 1975.The cinema (BFI, Southbank) was packed, James Ferman was there for a q&a, made an utter fool of himself ( …" you really think you're watching reality, we can't possibility release it ..." And meanwhile I had literally fallen in love with movie. It opened theatrically a year-and-a-bit later with a GLC certificate in London only. At the PrinceCharles, which had already established itself as a cutting edge venue with Last Tango in Paris and Fellini Satyricon. Censorship was seriously bad in those days - James Ferman's BBFC cut Warhol's Frankenstein to ribbons and, when challenged by a journalist, replied that it was a terrible film and why did anybody care about it? The philistines were indeed running the show. 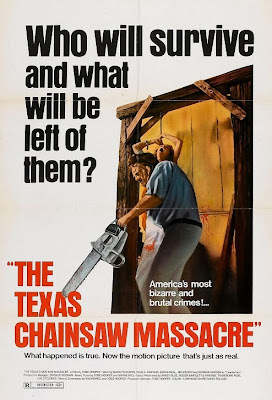 Despite claims that TCM had been cut for a London 'x' rating, the first time I saw the release print, I recall only seconds being trimmed when Leatherface wields the saw to slice into Kirk, and believe me I was alert to censorship. I saw Chainsaw half a dozen times in the 70s, including a late show at the old Electric Cinema in Portobello Rd on a double bill with Communion ((AKA Alice Sweet Alice). I was a columnist for a UK entertainment mag at the time TCM received its initial London-only release and I attended the press screening. The 'critics' I encountered afterwards despised the film. However, Alan Brien, in the Sunday Times, 'got it' as you say, and wrote a perceptive review. I can write from memory a copy of Time Out's extended caption for that first Film Festival screening, and will do so later for you. SALO was indeed showing at the little movie theatre in Old Compton St when the cops raided and seized the print. I was there to buy my ticket and was very pissed off when the Bill came trundling in. Iain, fascinating stuff, many thanks !